Greetings all, So much has happened since I last wrote, but most of you know about that, so I will save it until I have time to do it justice. Instead I will bring you up to date on my trip to San Francisco. A trip you say? Yes, I am here on business, and I arrived yesterday. I am attending the WebSphere Technical Exchange, and while I'm sure IBM wouldn't notice any hype increase I may cause if I sat here and blogged about their products, I know that none of you care about them. So I will stick to details of my trip, which will include tourist sites, tacky stores, and meals from the best San Fran has to offer. So I flew Air Canada, and was suckered into a 5$ sandwich because I was hungry, but it was bad, otherwise my flight was uneventful, and largely relaxing. The flight crew found me a seat on an aisle without someone beside it, while I don't overflow into neighboring seats, I did appreciate the extra seat elbow room. On the flight I met up with a fellow RBC'er who didn't have any particular plans for his first day, so he got sucked into my fiendish schemes, the first of which was to go to Alcatraz. So the problem was that the taxi driver dropped us off at Pier 39, and for those of you who aren't in the know, the piers are go in 2 number increments from some central point, with evens in one direction, and odds in the other. The main tourist area seems to be between Pier 33 and Pier 45 (I think) and the famed Ghirardelli Square (famed for the Chocolate factory, wink wink) at that farthest point. 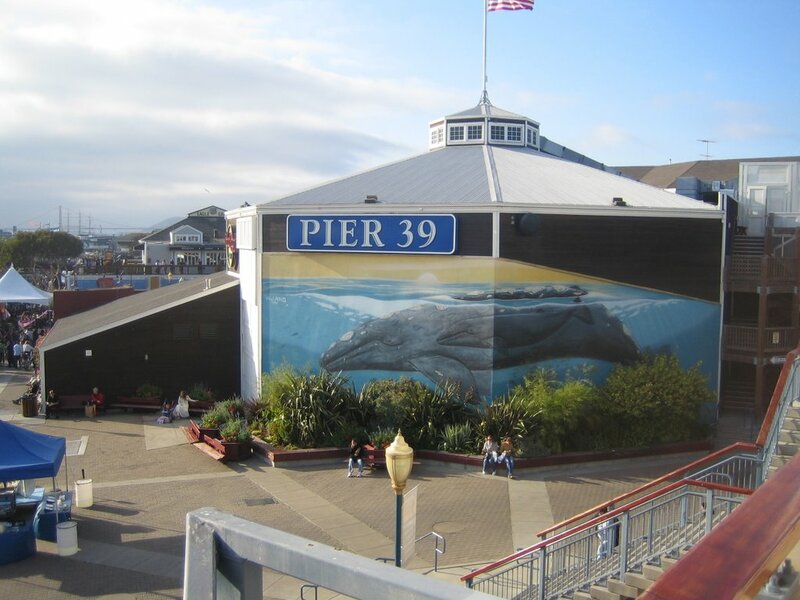 So Pier 39 is just teaming with stores and 'stuff' but what it doesn't have is a boat to Alcatraz. 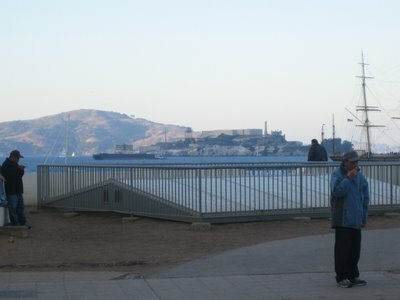 So we had a brief look around the pier in search of said boat, and then we saw a sign "Boat to Alcatraz at Pier 33." No problem, we will just walk down there, its only about 1/2 mile. When we got to Pier 33... "Sorry last boat for the day just left..." Arggggggg. So it isn't a total loss for me, as I am here until Saturday, I will just head out on Friday, Jerry (my co-worker) won't be able to go. 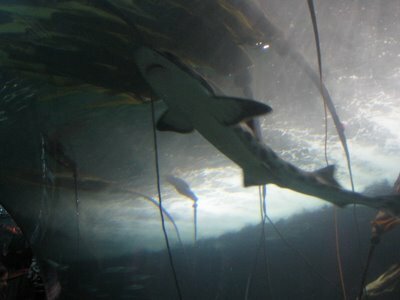 So we hiked back to Pier 39, and had a closer look in the stores, and then took a tour of the Aquarium, which was pretty neat. We then continued up the bay stopping at all the piers for a look around, mostly just window shopping of course, but we peeked in the front door of Riply's Believe it or Not, and the Wax museum. I may or may not have bought a big box of truffles. 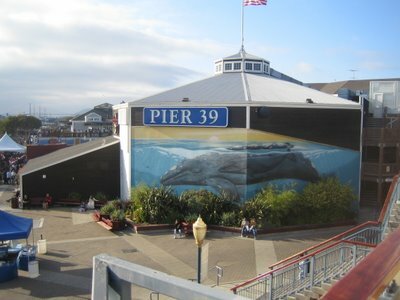 Finally we came full circle to Pier 39 for dinner, as the lady at the info shop gave us the AAA discount at any restaurant on the Pier (that being 20%.) 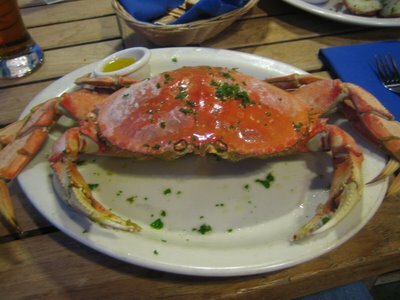 So I had for dinner the San Francisco specialty, giant honking big crab (I think it is actually called Dungeonese Crab but I'm probably wrong). Then it was back to the hotel to rest. So I will post them later. Two things... First, not all your readers will be dead fast on ignoring the product details, and second, that is one big-adze crustacean! Can't eat those things myself, but Yowza! How can you eat something with eyes? Its soooo cute... poor little (likely endangered) crab... well if the eyes didn't get ya - you'd think the name dung nose mighta. 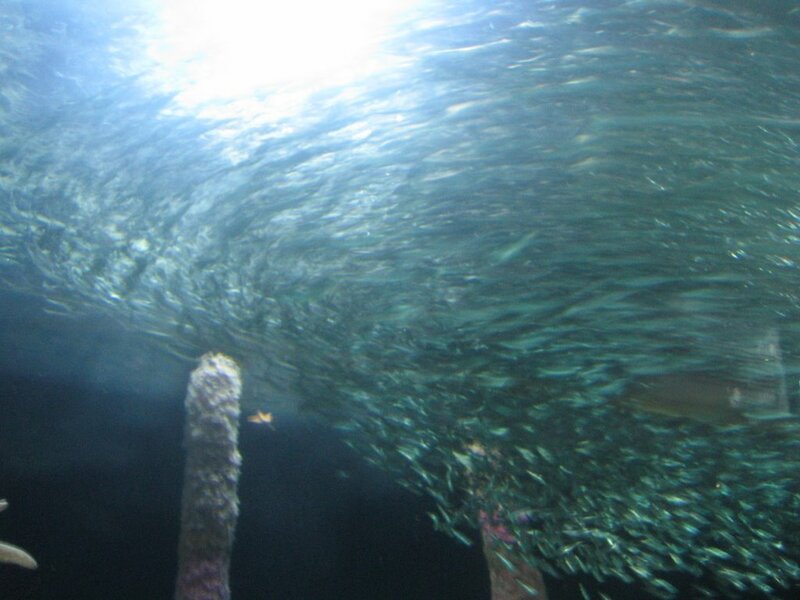 Looks like fun... he he.. I thought the idea was to escape from alcatraz, not escape to alcatraz.